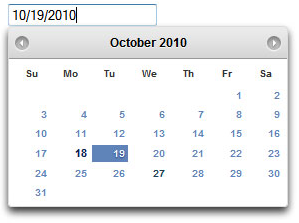 In our latest build, we've started adding in the new HTML5 date picker widget. Pictured at left, this new HTML5 feature is a nicer, slicker date picking widget than we had used in the past. 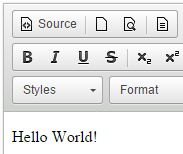 For now, it is mainly supported in recent Chrome and Opera browsers. But, eventually it will be supported in all major browsers as HTML5 becomes the default standard on the web. So, if you are using chrome with our platform now, you will be able to take advantage of this new and improved feature. Here at CitySoft HQ, we get pretty excited about software upgrades. Today is exciting because we are announcing a big upgrade to our web editor (pictured at left) and file manager (pictured at right). Both of these components are very important parts of our platform and both are licensed from one of the best web software companies around - CK Source. In case you aren't familiar with web software jargon, the web editor (at left) is for editing web pages, articles and emails within our platform. And, the the file manager (at right) is for uploading and managing images that are used within web pages. We've used the CK Source web editor for years, but are excited to have their very latest version built into our platform. Furthermore, this is the first time we've included the CK Source file manager in our platform. You can learn more about CKSource here. You can learn more about CKEditor here. You can learn more about CKFinder here. Customizing our free web design themes for a web site is a very affordable way to get up and running quickly with an attractive, contemporary design. CitySoft offers a library of free web site design themes (here) which are completely open source and free. Although we designed them for use with our software, anyone can use them. When our clients use one of these themes for their website, there is usually a short process of customizing the theme for a specific client. We thought it would be helpful to show an example of what a customized theme can look like at the end of the process. 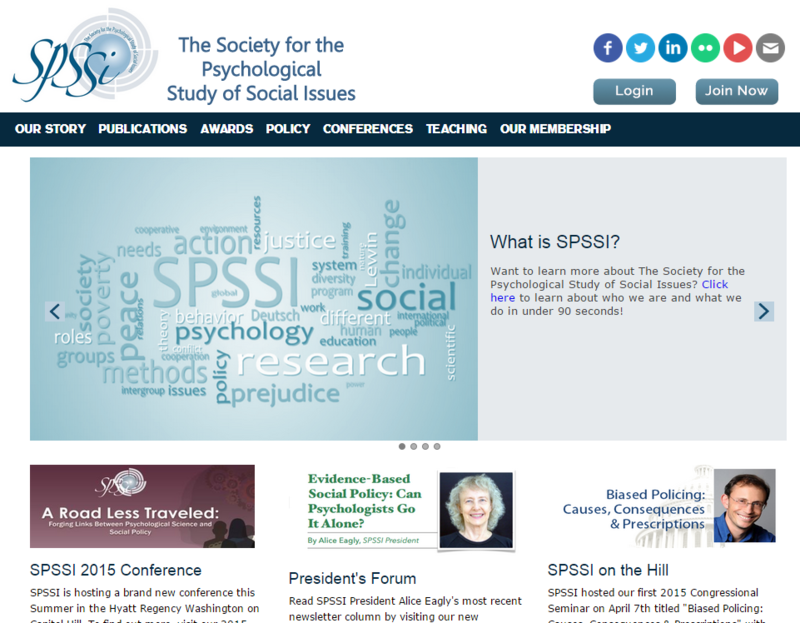 Recently, a long-time client (The Society for the Psychological Study of Social Issues) re-designed their website using our Professional theme. They were happy with the final results, which can be seen here. The initial theme (with no customization) can be seen here. I just wanted to take a moment to note a cool new international client and their mobile responsive theme. The American Malaysian Chamber of Commerce (AMCHAM), based in Kuala Lumpur, has launched a public web site using our Community Enterprise platform. This new deployment highlights a number of the platform's strengths including a mobile responsive theme that can be used with both traditional web browsing as well as browsing through a mobile browser. AMCHAM also uses the platform as a CRM database to manage their data and seamlessly integrate the web site with the management of data. This dual web site management and data management capacity allows clients to manage a larger range of processes (e.g. web sites, databases, email newsletters, directories, etc.) from one login and within one database. And, with our tight integration with PayPal and internationalization features, AMCHAM can conduct ecommerce in their local currency. 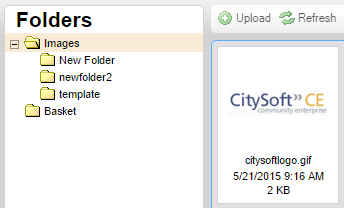 CitySoft has added several new features to the Articles module that are worth noting here. The articles module now includes both History and Rollback features (as pictured). The means that each time an article is added or edited over time, all versions of the article are saved in the database. The older versions can be viewed from the article history screen. And, at an time an administrator can "roll back" an older version of the article and make it the current version. This history and rollback functionality also exists in the Pages module and with page sections. These features will be added to more modules in the future. Although extensive caching already exists in Community Enterprise, we have recently added some new caching features to the Articles module. With this new functionality, articles are stored in cached versions on the server. These articles can be retrieved and displayed more quickly than in the past, improving client and user performance. The North American Institute of Orthopaedic Manual Therapy (NAIOMT) has been a long time user of CitySoft's Community Enterprise (CE) platform. Recently, they relaunched their site on CE with a stunning new design. The theme was built from scratch and implemented entirely by a third party design and marketing firm, Massachusetts Communications, with minimal need for outside support. The design is clean, stark, and strikingly beautiful. And, it is responsive for mobile browsers. This modern theme is yet another example of the strength of the CE platform in enabling distinct and fully featured site designs. The Minority Corporate Counsel Association (MCCA) recently launched a beautiful new theme on one of their web CE based web sites. MCCA uses a wide range of features within the Community Enterprise platform, including making use of the option to host multiple different web sites with different themes from one administrative login. Recently, they launched a very modern theme on their Gala web site. The site is very light weight while also being slick and highly stylized. And, of course, it is fully responsive for mobile browsers. MCCA implemented this theme with their own staff, without the help of outside consultants or designers. You can see all the details at http://www.mcca.com/gala. A great new feature has been added to the Organizations module that will be useful to clients who use CE to track organizations and the contacts within those organizations. Within an organizations record, in the past you could track primary contacts and regular contacts (e.g. employees) of an organization. 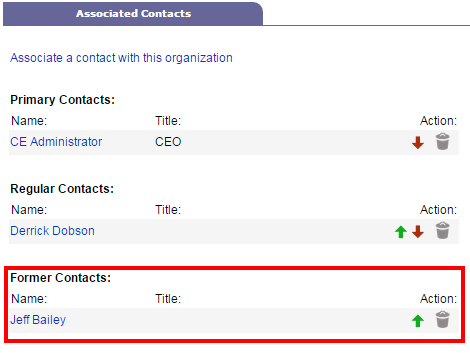 Now, you can also track former contacts of the organization (as pictured below). This means that when an individual leaves an organization in your database, you can retain that historical information by simply changing their status within the organization record to "Former Contact." The organization record will maintain a list of all former (as well as current) contacts. I just wanted to note a small but important improvement to our email preferences feature which makes it easier for a user receiving a blast email to update their name and email in the database. In the past, this would require that the user login to the system to update their profile. That still works well, but is a little cumbersome because it requires logging in. Now, a user who receives a blast email from our platform can update their name and email directly from the preferences screen without needing to login (as pictured in the graphic at right). When they do, this also generates an activity in their record so that an administrator can easily see or report on this activity. We're finishing off some enhancements to a little known hidden gem of a feature in our platform - the File Upload channel. This channel allows a user with permissions to login to a web site and securely upload files that are associated with them and their organization / company (which is also tracked in the database). This feature has helped clients that manage organizations and need employees of those organizations to submit documents (like quarterly reports). This can be easily managed online with our platform. The new enhancements help a client manage more documents, with an easier interface, and more searching, sorting, categorization, and downloading options. In addition, an admin can limit the types of documents (e.g. .xslx, .pdf, .doc) that users can upload.